This is a genuine Dyson spring catch for your vacuum cleaner. .. Compatible push button on / off switch for a select range of Dyson vacuum cleaner models. Ple..
Dyson DC18 lifetime filter for your Dyson DC18 vacuum cleaner. This filter is a genuine spare par..
Genuine Dyson vacuum cleaner Flat Out Head floor tool. .. 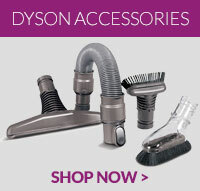 The Dyson Stubborn dirt brush attaches to the hose or wand on your Dyson vacuum cleaner for dislodgi.. Compatible replacement Dyson DC18 vacuum cleaner filter. .. The Dyson groom tool removes loose hair directly from your dog before it's shed around the home. .. This brushroll is a genuine spare part for select models of Dyson vacuum cleaners ..
3 Dyson tools for a cleaner car interior in a handy case. Includes Mini turbine head, Flexi crevice .. This tool is a genuine spare part for various models of Dyson vacuum cleaners ..
Genuine replacement end cap for your Dyson DC18 vacuum cleaner .. This is a genuine replacement Dyson-designed floor tool for your vacuum cleaner. Adjusts to ha.. This wheel axle is a genuine spare part for select models of Dyson vacuum cleaners .. Replacement combination tool for your Dyson DC18 vacuum cleaner. The debris nozzle on the combinatio..